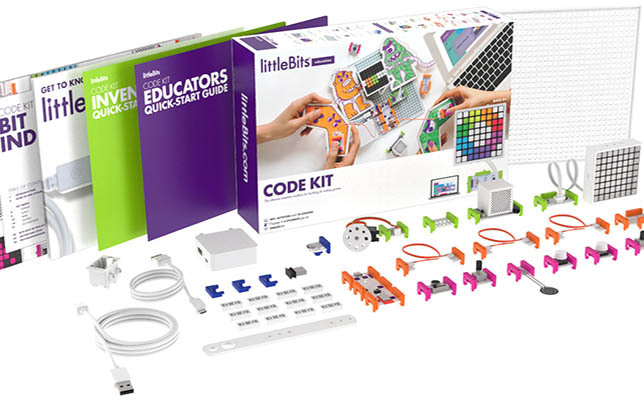 New York-based hardware startup littleBits, known for its electronic building blocks and for being part of the Disney Accelerator program, has unveiled a new kit that teaches students how to code. The upcoming littleBits Code Kit is designed to teach students in grades 3 to 8 the foundations of coding and engineering through hands-on activities and gaming. An accompanying app* for PC, Mac and Chromebook devices that provides step-by-step instructions for easy block-based programming. Bits snap together with magnets and are usable with other kits offered by the company. The Code Kit app’s block-programming interface is based on Google’s Blockly, a drag-and-drop visual code editor. The startup is part of the Disney Accelerator 2016 cohort and has raised $60 million in funding, TechCrunch reported. The littleBits Code Kit will be released in June. The company is currently accepting advanced purchase orders for the kit, which costs $299.95. It will be sold on littleBit’s website and Amazon. To learn more about how the electronic building blocks work, watch the video below. Further information is available on the littleBits site. *Update 3/8/2017: An earlier version of this article stated the app works on mobile devices. However, it is only compatible for PC, Mac and Chromebook devices.